Should I lift for me or others? So it is time in the string of upgrades to do a lift kit. So I start looking at my options. I find a few options out there for my countryman because I made A choice to go proven kit and not reinvent the wheel here. So I look at price and find one for under $300 that gives me four metal pices that were welded together and no other parts. Then I find another kit for some more money that is hand welded with longer welds on metal plates for another bolt and go solution.. So I think to myself if I lift my car there are no other things that need to change... Nothing needs to be longer or adjusted? Now I find the kit by M7 that has " suprise" A set of adjustable sway bar ends or maybe while we have it torn appart I might want to stiffin the ability of my car not to tip or sway due to the center of gravity will change. So i get the 20 sway bar instead of the 15 that comes with my car and works when on the ground and not lifted. So then I find that the M7 spacers are not welded ( some welding parts fail under stress) the M7 kits are cast to racing spec not just welded. So I got my kit with full lift and updated support.. The kit does not come with directions printed... They need to be printed from online so print these now when you purchase the kit so you can READ THEM . They are easy and to the point.. but you will be finding yourself calling your dealer for a few questions on your specific model and year. Mainly tork levels on some bolts when you rebuilt with the kit... overall easy ( if you follow directions) and when done you need a complete 4x4 alignment ( suggest you find a place with a new Hunter system).. now tires?? Ya it is not just a kit but now new tires.. Big style truck knobby tires look real cool.. but on a paved road could be LOUD as in 90+ decibels... so in most cases you got what you choose good or bad so " THINK ABOUT QUIET OR COOL LOOKING" now new tire size? 215 60r17 fits great.. But no off road tires come in that size so if you go that way you will go 225/65r17 and they will hit when you turn, when you bounce... just to warn.. So it is time in the string of upgrades to do a lift kit. So I start looking at my options. I find a few options out there for my countryman because I made A choice to go proven kit and not reinvent the wheel here. So I look at price and find one for under $300 that gives me four metal pices that were welded together and no other parts. Then I find another kit for some more money that is hand welded with longer welds on metal plates for another bolt and go solution.. So I think to myself if I lift my car there are no other things that need to change... Nothing needs to be longer or adjusted? 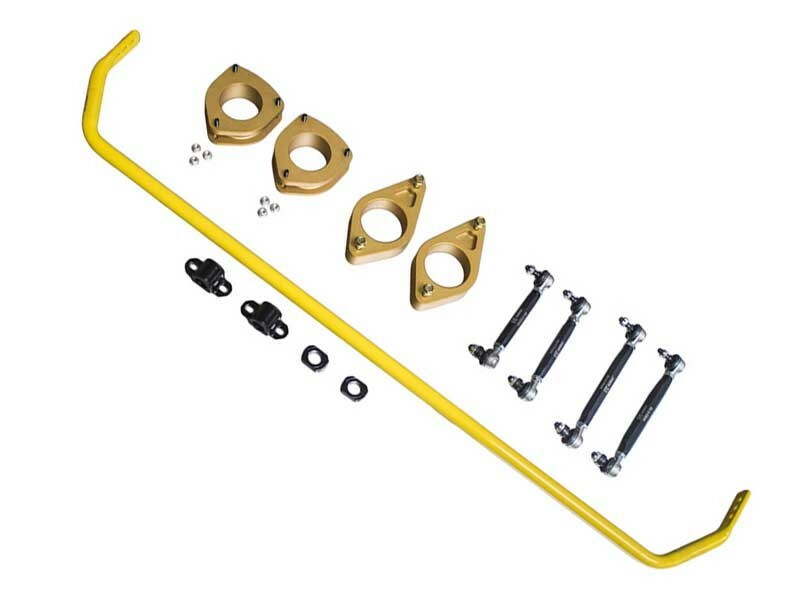 Now I find the kit by M7 that has " surprise" A set of adjustable sway bar ends or maybe while we have it torn apart I might want to stiffen the ability of my car not to tip or sway due to the center of gravity will change. So i get the 20 sway bar instead of the 15 that comes with my car and works when on the ground and not lifted. So then I find that the M7 spacers are not welded (some welding parts fail under stress) the M7 kits are cast (machined solid aluminum billet blocks) to racing spec not just welded. So I got my kit with full lift and updated support.. The kit does not come with directions printed... They need to be printed from online so print these now when you purchase the kit so you can READ THEM . They are easy and to the point.. but you will be finding yourself calling your dealer for a few questions on your specific model and year. Mainly tork levels on some bolts when you rebuilt with the kit... overall easy ( if you follow directions) and when done you need a complete 4x4 alignment ( suggest you find a place with a new Hunter system).. now tires?? Ya it is not just a kit but now new tires.. Big style truck knobby tires look real cool.. but on a paved road could be LOUD as in 90+ decibels... so in most cases you got what you choose good or bad so " THINK ABOUT QUIET OR COOL LOOKING" now new tire size? 225 60r17 fits great.. But no off road tires come in that size so if you go that way you will go 235/65r17 and they will hit when you turn, when you bounce... just to warn..
You're reviewing: R60 Countryman Off-Road 2" Lift Kit Suspension Bundle | Stage 2 IN STOCK - READY TO SHIP!